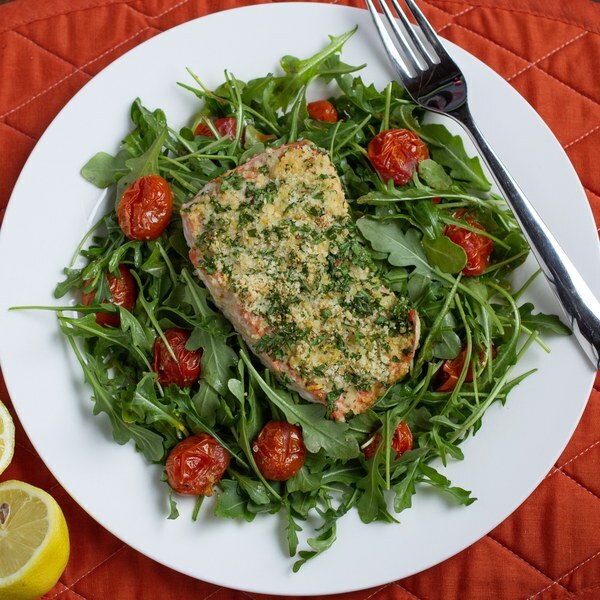 ← Herb Crusted Salmon with Arugula & Roasted Tomato Salad. Line a baking sheet with parchment paper. Using the back of a spoon, rub salmon filets with Dijon mustard and place in the middle of the pan. Place grape tomatoes on either side of the salmon filets. Drizzle tomatoes with oil and season with salt and pepper. Grate the zest from the lemons into a small bowl. Shave the parsley leaves off the stems; discard the stems and mince the leaves. Add parsley to lemon zest and then add almond meal, salt and pepper and stir to combine. Top salmon with herb mixture and press so that the crumb adheres to the salmon. Place in the oven to bake for 8-10 minutes or until the salmon is nearly opaque. While salmon cooks, make the dressing. Juice the lemons into a medium bowl; add olive oil, maple syrup, Dijon, salt and pepper, whisk to combine. Add arugula to the bowl and toss to coat. To serve, put salad on plates and top with roasted tomatoes and salmon filet. Enjoy!